Have you seen the new Ralph Lauren Resort collection yet? We love all the raw denim, and the palette of black, white and khaki is classically elegant. Although you can't buy any of these great new looks yet, we think it's smart to plan ahead to make sure your next designer clothing purchase won't be out of fashion any time soon. Shop our favorite looks to get a jump start on 2016 today! With Big Apple Buddy's fast international shipping, you can now buy from the Ralph Lauren USA store no matter where you are in the world. This Ralph Lauren shirt (US$365) is a crisp, white button-down tailored to fit a woman's curves. Save it until you can get the black denim maxi skirt in 2016, or pair it with the Polo Ralph Lauren Wimbledon Cotton Jacket (US$298) for some UK flair. Tennis fans from France to South Africa and even Hong Kong will nod in approval when you rock this look. 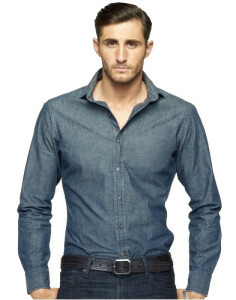 Men can take advantage of the denim trend that's coming next spring with this dark wash denim shirt (US$265). The tailoring is sharp enough for dressy occasions, but the fabric works for casual events as well. This Ralph Lauren shirt will take you anywhere in style. From New Zealand to Singapore, everyone loves the classic, breezy look of the original Polo shirt. For an up-to-the-minute upgrade, check out the Skinny-Fit Big Pony Polo Shirt (US$98). The slim tailoring keeps you looking smooth and casual no matter what the occasion. Grab one in Cabana Purple knowing that this great shade will be back in full force during the spring of 2016. Men can enjoy the classic Ralph Lauren polo, too. A great choice for any time of the year, the Classic-Fit Mesh Polo (US$85) is available in 19 great colors. There were so many great Ralph Lauren shoes on display this year, but the look that came up time and again was the classic, pointed-toe black pump. 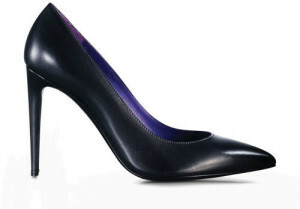 The Celia Napa Pump (US$525) is made by artisans in Italy and work with everything in your closet. They'll also have you primed and ready for the summer before anyone else. Not many dresses take you from winter to spring as easily as this one. The Kalee Dress (US$1595) is warm enough for winter but bright enough for spring, and the black-and-white combo blends right in with Ralph Lauren's 2016 Resort collection. If you can't wait to get your hands on these great Ralph Lauren looks but can't get to a store in New York, don't worry. With Big Apple Buddy, you can get the latest Ralph Lauren fashion overseas without worrying about international release dates. Whether you need items in Singapore or Sweden, we can make your U.S. purchase and ship it internationally in as little as just a few days. We ship to over 110 countries, including Australia, Austria, Belgium, Canada, Denmark, France, Germany, Hong Kong, Ireland, Israel, Italy, Japan, Kuwait, Malaysia, the Netherlands, New Zealand, Norway, Saudi Arabia, Singapore, Spain, South Africa, Sweden, Switzerland, Taiwan, Thailand, the United Arab Emirates and the UK. Come see what we're all about and get a free international shipping quote today!